Our sissy bars are the worlds only universal motorcycle backrests that are not only unique, but designed to last forever. 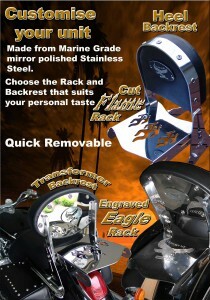 Made from marine high polished stainless steel to look like chrome but will never pit or rust on you. Our quick removable sissy bar and rack fit all cruisers with two bolts on each side of the fender rail. With four different backrests and nine different luggage racks to choose from, we are confident you will find the look you want. All our units come with everything. Not like many who hide behind the small print. We offer a three year warranty on our sissybars and no other company does that. That’s how confident we are. So ask yourself, Do you plan on keeping your bike for any length of time? Even if you sell your bike, keep the backrest and rack because you can use it on your next bike for a minimum cost if not nothing, just by ordering the components that are required if bike is different. Quality Stainless Steel is made from nickel and chromium. That’s why it’s so hard and durable. That’s also why we guarantee our units to outlast any others. Because our units come with a blank bottom (Permanent) Mount, we call them a kit. Whether you need a curved or straight bottom mount, they come wrapped together in a cardboard template to protect the finish and all you have to do is mark and drill both at the same time where your mounting bolts are on the bike. It’s that easy. The removable top section locks onto the permanent bottom mount and can be removed in seconds leaving very little to be seen on the bike. All units come with a DVD to show step by step how simple they are to mount. 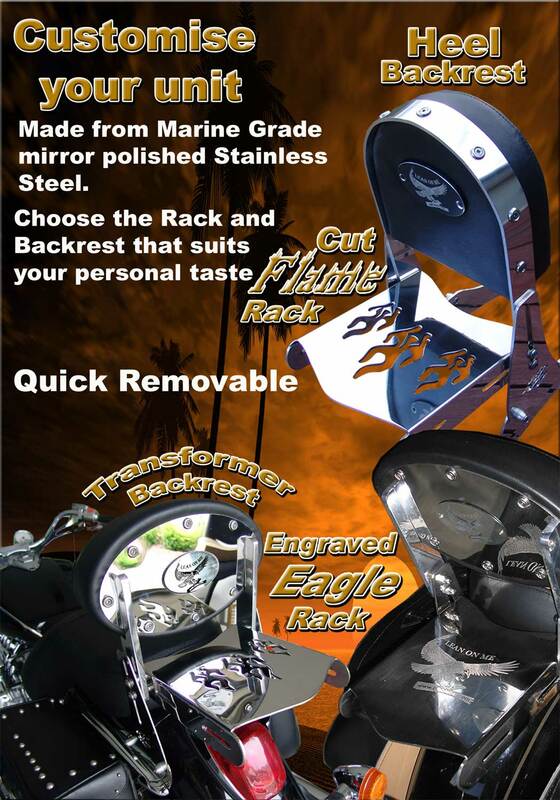 You can choose your rack – Cut flame design, Boomarang, Engraved Eagle or Model Logo – here. You have a choice between our Mini Heel Pad (shaped like a Heel) Full size Heel, the Transformer Pad that is oval shaped, contoured for a comfortable fit with a stainless back plate for more bling or the lounge for super comfort and security. If you’re still confused, just let us know what you intend to put it on, Make year and model, we will make sure you get the proper parts. Just let us know what styles you want.